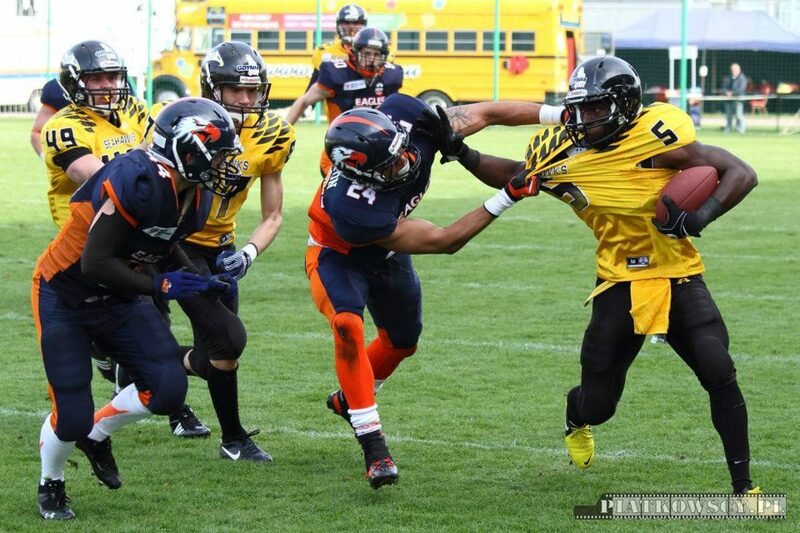 When the Warsaw Eagles and the Gdynia Seahawks last met, the two teams ran up a total of 89 points on the grass of Warsaw's National Stadium last July. On Saturday, facing each other at the Eagles' new home on Konwiktorska Street in one the early season's most anticipated fixtures, they only managed 27. The end result was the same, however, with the Seahawks prevailing 20-7 to run their winning streak to three straight against the Eagles and 14 straight overall dating back to last year. With the field at Polonia Stadium fitted with new goalposts at either end, neither team threatened the end zone in a first quarter that was played mainly 'between the twenties'. The Seahawks had the best chance of the quarter, moving the ball well on an opening drive that eventually stalled in Eagles territory. Warsaw got a scare late in the quarter when quarterback Shane Gimzo left the field after an injury, but he only had to sit out a few plays before returning. Much of the second quarter went the same way, with the teams battling for field position throughout. A long run by Piotr Osuchowski got the Eagles into scoring position, but Peter Plesa intercepted a Gimzo pass in the end zone to keep the score knotted at zeroes. 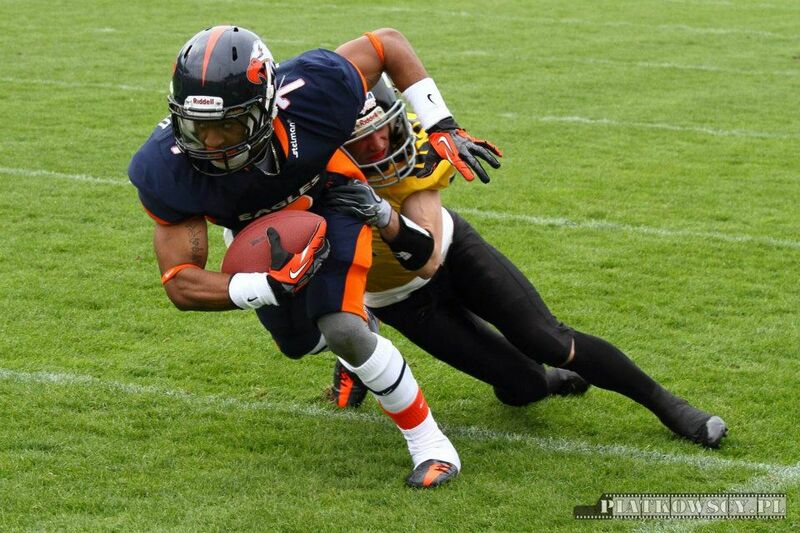 The Seahawks couldn't do much with the turnover, however, as Dominik Koniusz quickly intercepted Gdynia quarterback Ferni Garza to give the ball right back to Warsaw. A long run by Gimzo once again put the Eagles in good position, and this time Clarence Douglas Anderson made the most of it with a 14-yard touchdown run. Gdynia's response was swift, however, with Garza's passing leading the Seahawks down the field on an impressive drive that ended in a Marcin Bluma touchdown reception. The Eagles led 7-6 at halftime. The Seahawks defense held the Eagles without a first down in the third quarter, stuffing the Warsaw running game for little or no gain on nearly every play. Garza finally gave Gdynia the lead late in the quarter on a 20-yard touchdown pass to his 19-year-old receiver Patryk Kordyś. The two point conversion attempt failed, and the score was 12-7 going into the final frame. Gdynia essentially put the game away in the fourth quarter with a 17-play drive that ate up nearly 10 minutes of game clock. The Eagles stopped them twice on the drive, only to have penalties on fourth down leave the ball in Gdynia's possession. Warsaw nearly got the ball back on an apparent fumble as well, but the officials ruled that the runner's progress had been stopped before the ball came out, and the drive continued. Facing fourth down for a third time, Garza found Kordyś for a 14-yard reception to convert, and Jeremy Dixon ran 20-yards for a touchdown shortly thereafter, diving at the right pylon to score. The Seahawks are now 4-0 on the season, and currently hold a commanding lead over the other teams in the Topliga North Division. The Eagles, on the other hand, are now at 1-1, trailing Kozły Poznań by a half-game. The Eagles can reverse that situation in their next game, which will be against Kozły, the same team they beat to open the season. The Seahawks and Eagles will meet again later this year, in Gdynia on June 9.